Lake Bastrop is a power plant lake. And not just any kind of power plant, it's a natural gas power plant. This means the water is generally clean and the countryside isn't covered in black scum. To be sure, there IS some oily substance that appears once in a long while, but honestly, I can't be sure if that comes from the power plant since I've seen that on other lakes. Maybe it's because most of Texas is sitting on an oil field or something... But generally the lake is fairly clear with a very dark bottom. There are quite a bit of weeds in the lake but not enough to be a problem for the most part. Along the shorelines you'll find a large amount of reed-like grasses along with shorter types of water-based vegetation. 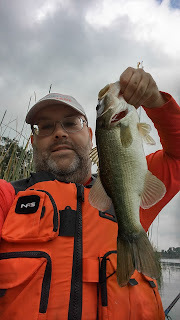 Some areas are near deep water which makes for the perfect spot to hunt for bass. the outlet from the power plant. This all said, I'm sure some of you are thinking that this sounds like the perfect lake. Well, it is... when it's cold outside. 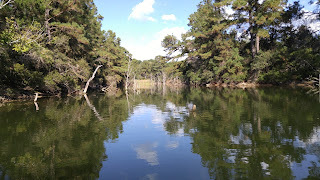 The main problem with Lake Bastrop is also the same reason it's a fantastic lake: The Power Plant. 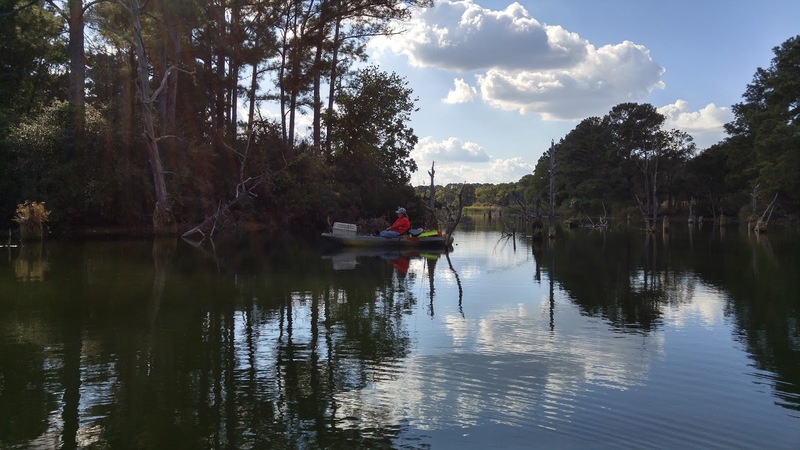 The plant warms the water about 10-15 degrees warmer than other similar lakes. While this is great in the winter, it's horrible in the summer. The water during the summer can be as high as 100 degrees... but generally in the 90s. During the winter though, the lake varies from 70s near the outlet to upper 50's at the inlet to the power plant. According to Texas Parks and Wildlife, the lake doesn't turn out major lunker bass, but it does have many fish that are over 3 pounds so it makes for a fun lake to fish. In fact, our experience seems to lean toward the fact that there aren't many small fish comparatively. I can count on one hand the number of dinks I've caught there and have caught many fish over 17 inches. 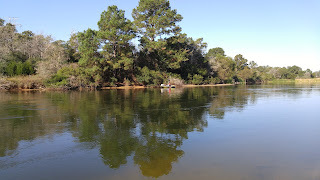 Recently I used this lake to put me as #3 in the Yak-Tribe tourney of those who exclusively fished for Bass. 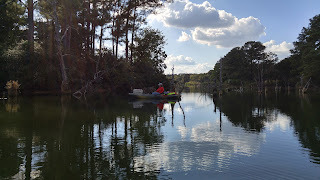 Those who know the lake can really do well as we've seen old timers catching 40 fish a day here. Lake Bastrop has a couple options for RVers. There's our personal favorite - the North Shore Park, but there's also the South Shore Park. We have never gone to the South Shore Park, but one of the hosts we met declared that the South Shore was a nicer park that the North Shore. I would say the main reason we didn't go to the South Shore is because we normally go in the winter so we want to be near the power plant outlet where it's warmer. Both parks are run and owned by the Army Corps of Engineers. So for those of you who are work campers, you may want to check these parks out! They are popular places to be in the winter for work campers due to the light load and the fact that in the winter usage of the park is fairly low. Summer time is another story since the parks are extremely popular and get very crowded on the weekends. 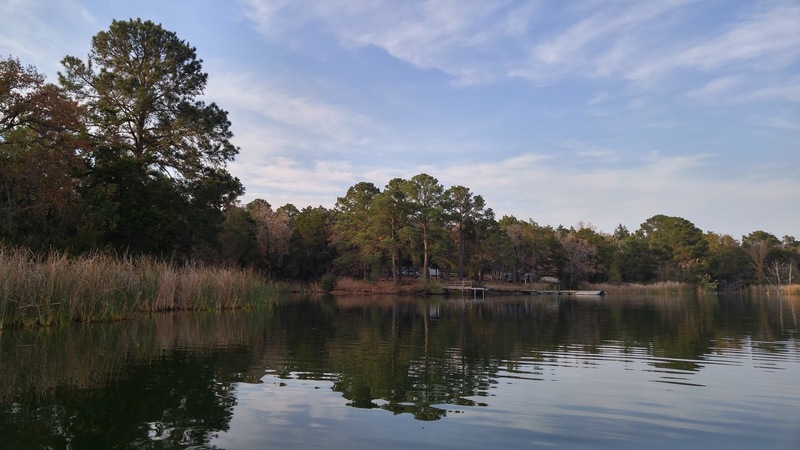 If you love the pines from up north but hate the winter weather, you definitely should check out the Lake Bastrop area for winter camping. 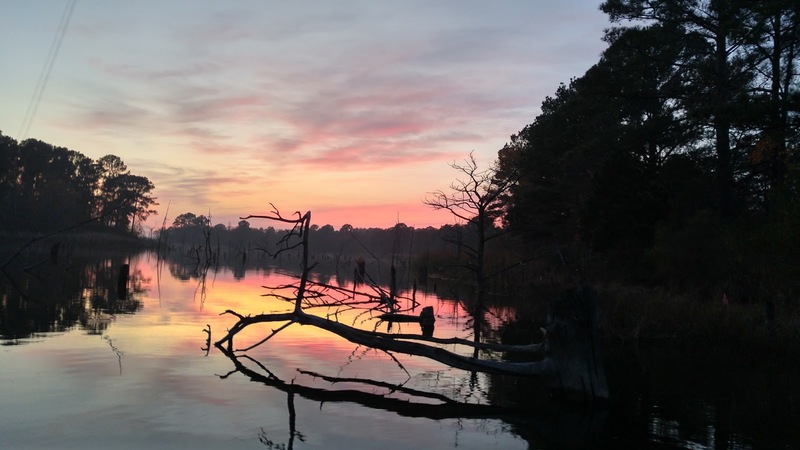 This area is called the Lost Pines Forest and has around 85,000 acres of Southern Yellow Pine forest that is completely separated from the rest of the "Piney Woods" forest of the southern states. It's the furthest west that these pines come and they are quite beautiful if I do say so myself! Lake Bastrop is one of the places we intend to spend some time in the future. 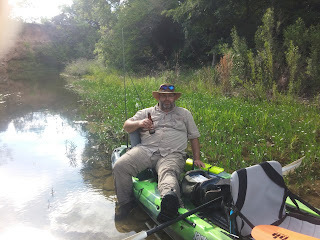 With the close proximity to the city it still allows fairly easy access for my work yet it close enough to make for a good place to stay where we can go fishing every day. I would love to spend some quality time on this lake learning it's secrets and maybe even attain to the old timers level and catch my own 40 bass in one day. Hope you enjoyed this style of writing. I'm trying to experiment with different styles of writing lately and will be interested to see how people respond. If you like this kind of thing, let me know! I really enjoy the comments I get and I *read* every single one. I have all comments sent to my email so I don't miss them. So feel free to start a conversation if something piques your interest!